Even though it’s often presented in bright colors and shiny posters, the periodic table is more like a mysterious map to the natural world, unlocking its secrets and uncovering its patterns for those who know how to look. There’s nothing else quite like it–it organizes the building blocks of every substance on earth, the chemical elements, and arranges them according to their natural properties, revealing fascinating things about the world that could hardly be guessed without it. Think of it like those ancient maps discovered in dusty old books in adventure movies. This map is your entryway into the grand adventure of Chemistry and inducts you into a highly prestigious order of scientists who came before you. Just by looking at this map, you can tell what a material might look like, how easy it would be to ionize, and what it will react with–knowledge that could save your life when faced with an unknown substance! Early scientists even used it to predict materials that hadn’t been discovered yet. It was like a guidebook to a secret world. Before they knew what atoms and molecules looked like and how electrons influenced chemical behavior, scientists observed patterns in the natural world and asked questions about the things around them. Why are some materials heavier than others? Why do compounds break down into other materials under the right conditions? Like any good mystery, these clues led to things the scientists couldn’t even imagine at the time. In the late 1800s, scientists realized that if elements were arranged in increasing order of atomic mass, their properties followed a mysterious pattern: they tended to repeat every eight elements. A scientist named Mendeleev organized the 65 known elements into a chart reflecting this pattern, which became the basis of the modern periodic table. But what made the elements similar to each other? What made them different? How could these patterns be explained? And why was eight such a magical number? The secrets of the periodic table would not be revealed until 1913, when Henry Moseley decided to fire beams of electrons at different atoms and observe the X-rays they released. Scientists eventually discovered that the properties of elements arose from how many protons each element had in its nucleus and how many electrons orbited in the outer shells. Noble gases, on the far right of the periodic table, are very unreactive because they have eight valence electrons — a full octet in their outer shell. Other elements need a full outer shell in order to be stable, so they react with each other until they can share enough electrons to be stable. Finally, the foundations of Chemistry could be explained. 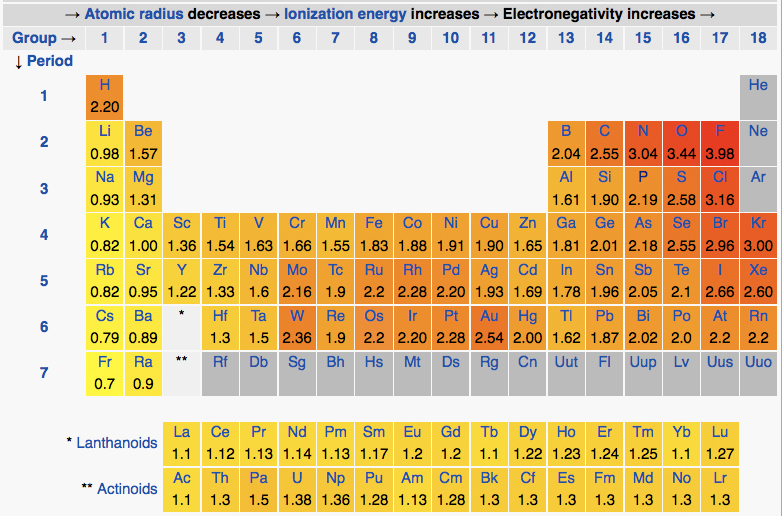 But the periodic table does much more than just list every element and a few of its basic properties. 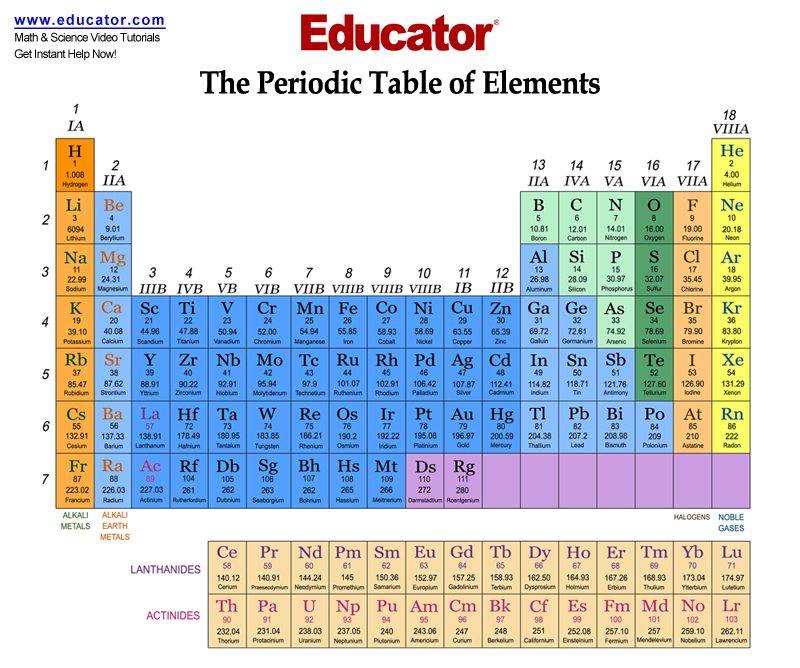 The periodic table can help you predict electronegativity, atomic size, and even what kinds of bonds the element will prefer just by looking at it. The key to interpretation lies in the power of the nucleus. There is a delicate balance in nature between positive charges and negative charges. At the center of every atom is a positively charged nucleus made up of protons (positively charged) and neutrons (neutral charge). Negatively charged electrons spin around outside the nucleus in clouds of various shapes depending on what orbital they are in. As you move from left to right across the periodic table in a period, the nuclei gain protons and neutrons, increasing their positive charge. This causes the atoms to hold their electrons more tightly, making it harder to remove them and shrinking the size of the atoms as the nuclei pull the electrons closer. As you move down the periodic table in a group, the numbers continue increasing and the nuclei keep growing larger, so you would think the same trends would hold true. However, electrons spin around the nucleus in clouds of differing energy levels. The electrons closest to the center shield the outer electrons from the intense pull of the nucleus, making them easier to to remove and allowing them to sit further away from the nucleus. Almost all of the properties of atoms come from these two trends: how tightly the nucleus pulls on the outer electrons and how many layers of electrons there are in an atom. The size of an atom is determined by these two factors. From left to right across the periodic table, atomic size decreases because the nucleus holds on to its electrons more tightly. From top to bottom, atomic size increases because there are more layers of electrons to shield the valence electrons from this pull. The ionization energy tells you how much energy it takes to remove an electron from an atom, creating a positive ion. This depends on the factors mentioned above–how tightly the nucleus holds on to the outer electrons and how many inner electrons shield them from the nucleus–but also on how stable an ion is. If it has eight electrons, it will be very stable and have a higher ionization energy than those around it. If it only has one electron in its outer shell, it may actually prefer to give up that electron so it can have eight electrons in the next highest outer shell instead of one extra. This is why some atoms in the first group Sodium easily form positive ions–but this has to be balanced against the other two factors as well. This is the opposite of ionization energy. It shows how easy it is to add an electron to an element. The same three factors apply: nuclear strength, electronic shielding, and how close an element is to reaching an octet. This makes it very easy for elements like Oxygen and Fluorine to accept electrons and very difficult for an element like Potassium. 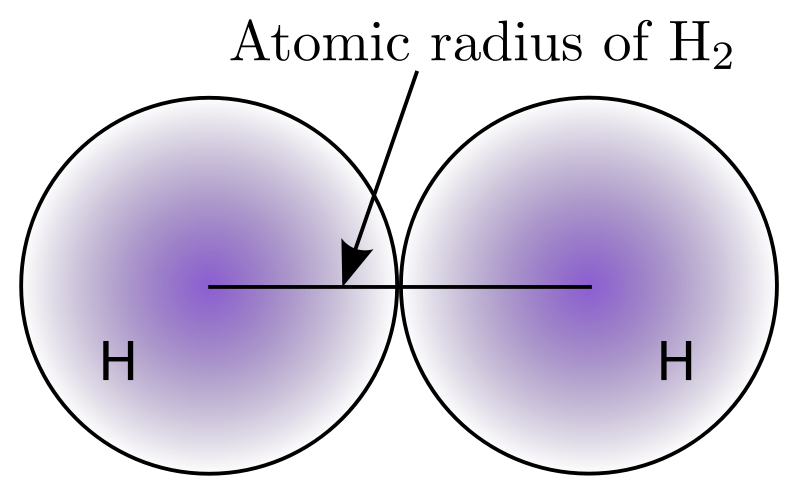 Some atoms hold on more tightly to electrons in bonds than others do. If an Oxygen is bonded to a Hydrogen, the electrons will stay closer to the Oxygen than the Hydrogen because Oxygen is more electronegative. Atoms with more protons in the nucleus and fewer electron layers will be more electronegative, so electronegativity increases from left to right and decreases from top to bottom on the periodic table. If you keep looking closely, the periodic table can be used to predict even more aspects of chemistry than those listed here. Allow yourself to be guided by its properties, and you too can explore the secrets of the natural world! Check out our lesson on Atoms, Molecules, and Ions in our General Chemistry course where our professor will explain everything you need to know about the Periodic Table of Elements. We also cover other chemistry courses such as AP Chemistry and Organic Chemistry. © 2018 Educator, Inc. All Rights Reserved.